In another two part post, juniordoctorblog and guest writer Dr Hugo Farne look into the futures of a ‘Yes’ or ‘No’ vote on the junior doctors contract. Read Part 2: No here. Assuming a close vote, even a slim ‘yes’ majority will likely mean full implementation. – the Guardian system is coming online this summer. Guardians are senior medical appointees not holding another board position- hours around 8/week. 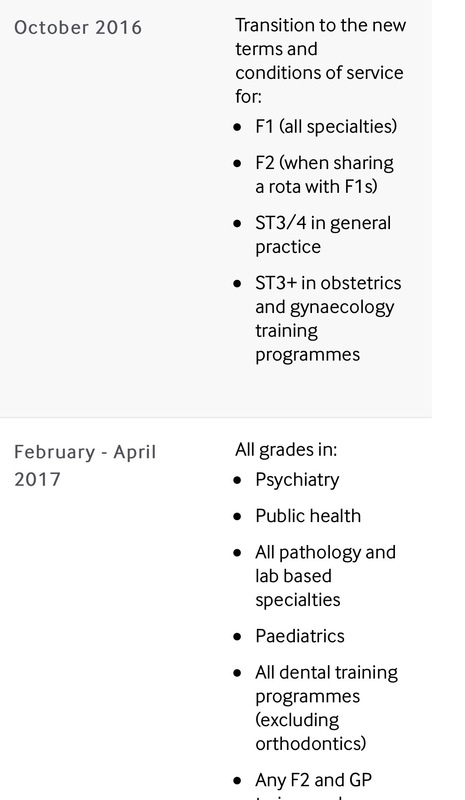 – The timetable for implementation as it currently stands looks like this. – Pay protection will keep pay on the old system up to 2022 for current ST3+ registrars. However the other terms of the contract will still apply as above. – New rotas to support the governments ‘seven day services’ should start to appear before that, and may apply before the new contract does, and definitely before pay protection ends. – Junior doctor forums should be formally convened by the DME and Guardian of each hospital. – You should be issued with ‘work schedules’ and notification of your educational supervisor in advance of starting. So far so good. But will this work? As Edison said, genius is 1% inspiration, 99% perspiration. Put another way, new ideas are easy to come up with but hard to make happen. Can the NHS and this contract actually achieve what we have been told it sets out to do? Early noises coming from rota designers suggest not. Indeed, the new restrictions on hours may perversely result in rotas that are worse for work-life balance, continuity of care, and training opportunities. Combined with the need to maintain service provision levels, i.e. have the same number of doctors on at any given time as we do today, it is very likely that rotas will require more staff and hence cost the taxpayer more. Take the example of the limit of 8 consecutive days, with a minimum 48 hour rest period after. This will end the common practice of working 12 consecutive days from Monday to the following Friday. This sounds good, but in practice doctors will have to work more weekends to make up their hours. Why? These doctors are currently rostered to work an average of just under the maximum 48 hours a week. That is usually a mix of 9-5 or equivalent 40 hours/week and an additional 8-hours of on-call time. With the new regulations after an 8-day run two additional weekdays will be taken as ‘rest’. As a doctor is rostered up to 48 hours per week, these additional hours have to be made up somewhere, and all of the weekdays are already being worked. Hence doctors may go from working 1 in 4 weekends to at least one weekend day in almost 1 in 2 weekends to make up hours, a significant deterioration in work-life balance. The enforced weekdays off also limit training opportunities, which are predominantly on well-resourced weekdays, and continuity of care for patients. 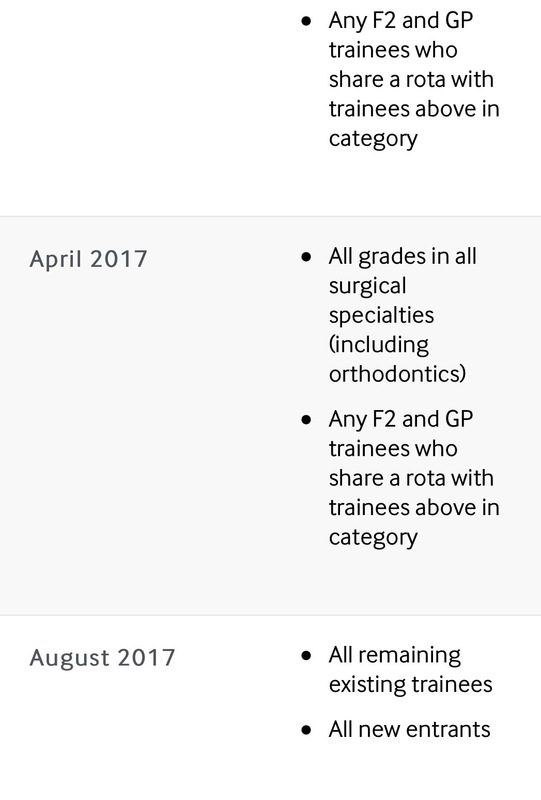 Moreover to maintain staffing levels during the week, more doctors will be needed on the rota to cover those now forced to take weekdays off. More doctors who would cost money – except for the fact that they don’t exist, so could not be recruited even if the fund were available. Another example is the stipulation that annual leave can only be taken on weeks when a doctor’s shifts fall entirely between 0700-2100. For those working in A&E, where service requirements are greatest in the afternoon and evening, rotas contain few if any weeks meeting these criteria. This essentially consigns A&E doctors to fixed leave. How has this happened? It may be neither party could foresee all the permutations. What will be the result if trusts do not have the staff or the fund to provide junior doctors both training opportunities and safe working hours? It is not inconceivable that both sides may find themselves renegotiating the detail and pushing back the deadlines. What will happen then? Some possibilities for renegotiation are discussed in Part II- No. Perhaps the rotas will work out- through as yet unseen additional MDT staff or changes in working practices. Or perhaps breaches will start occurring regardless: what will happen then? Well that will be up to you. If you vote yes and walk down this road you are taking away a No vote, and vice versa. In doing so you are taking on the responsibility to make this contract work. – Firstly you will need to join your local junior doctor forum, and make sure every junior in your hospital does the same. – The spending of penalty fines must have proper and rigorous oversight, with proper debate amongst trainees and consensus how these funds should be spent. – Any breach of the contract must be challenged by the forum as a whole; any individual trainee told to stop reporting breaches, any rota gaps hidden from view, any penalty money spent without forum involvement, any Educational supervisor not functioning as they should. – The JDF must work hard to improve the morale and working conditions of all juniors: this could include reinstating the mess, providing emotional support and even whistleblowing protection, perhaps by coordinating group reporting rather than individuals. Of course these are just more ideas. We will need more than inspiration if any of this is going to work. But if there’s one thing we’ve learnt from the last few months, it is that there are thousands of junior doctors willing to put in time and effort to fight for their contracts – more than enough to provide that 99% perspiration. Read Part II- ‘No’‘ before you decide. Juniordoctorblog.com with guest writer Dr Hugo Farne.